From goodreads: In a world ruled by Game Leaders, a dark and dangerous man proposes a wager…. “If you can escape me for seven rounds, Victoria – if you can keep from being taken off of the board for that long, I will admit defeat and step down as Gray leader. But if I find you,” he let the words sink in. “And if I capture you….” His voice trailed off just as his gaze trailed over her lips, her throat, her breasts. His green eyes locked on hers again and she felt she would die right there at that table. But this is a game far more complicated and far more deadly than either of them anticipated. 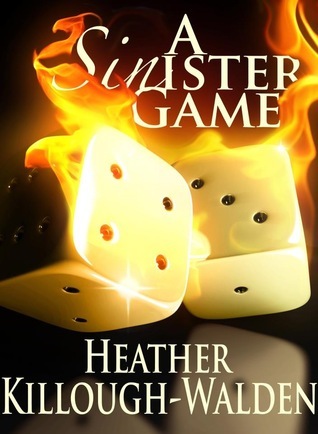 As the real world unfolds around them, what they thought they knew becomes obsolete, and the rules are ruthlessly changed… in this SINister game. I wasn’t sure what to expect when I was given an ARC of this book. It was hard at first to wrap my head around all the “gamer” references because I automatically associated that term with Xbox. However, there is nothing Xbox’ish about this book! While it is about a game that is being played and the key players are being watched by the Game Lord and the Gods it mustn’t be confused with video games. At least that was my perception of the story. It’s the future meets ancient times with magic everywhere you read and it’s amazing. I love a world where anything is possible and good will always overcome evil. My only two concerns with the book: I love the push and pull between the main characters but there wasn’t enough romance. Don’t get me wrong, the attraction was there but I wanted more of it. Also, the ending seemed a little anticlimactic. It was such an intense build-up and so emotional that the ending happened to quickly and neatly. More about the Gamers that are specifically Victoria and Victor, one plays for the light side and one plays for the dark side. They are either light or dark based on the abilities that were given to them and those particular abilities are magical in their own right. The plot starts off with a very seductive proposition by Victor Black to Victoria Red (dontcha just love those names). She doesn’t need any convincing to accept his proposition and that’s when the excitement begins. Just when I thought I knew who the players were, I didn’t have a clue. The good guys that I thought were trusted friends weren’t. The bad guys, who I thought were sketchy characters, weren’t. This book is fast paced with a lot of excitement and mystery. It’s a little hard to keep up with all the characters but it’s worth it to keep flipping back a page or two to make sure you’ve got it straight. The writing style is excellent and the dialogue flows naturally without a hiccup. Are you looking for a book that has a unique storyline, a little sexiness and mystery…then this is the book for you! If you can suspend your disbelief you will enjoy this book as much as I did! My final two cents: This is my first book by Heather Killough-Walden and it won’t be my last. This sure sounds like an interesting book. Will check it out.